Fomalhaut is one of the brightest stars in the sky. At roughly 25 light-years away the star lies especially close to us, and can be seen shining brightly in the constellation of Piscis Austrinus (The Southern Fish). 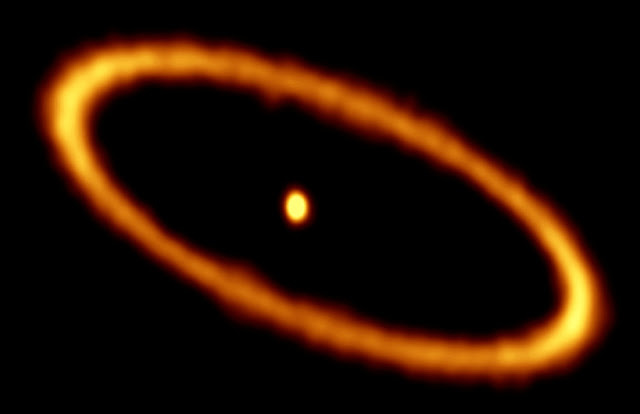 This image from the Atacama Large Millimeter/submillimeter Array (ALMA) shows Fomalhaut (centre) encircled by a ring of dusty debris — this is the first time this scene has been captured at such high resolution and sensitivity at millimetre wavelengths. Fomalhaut’s disc comprises a mix of cosmic dust and gas from comets in the Fomalhaut system (exocomets), released as the exocomets graze past and smash into one another. This turbulent environment resembles an early period in our own Solar System known as the Late Heavy Bombardment, which occurred approximately four billions years ago. This era saw huge numbers of rocky objects hurtle into the inner Solar System and collide with the young terrestrial planets, including Earth, where they formed a myriad of impact craters — many of which remain visible today on the surfaces of planets such as Mercury and Mars. Fomalhaut is known to be surrounded by several discs of debris — the one visible in this ALMA image is the outermost one. The ring is approximately 20 billion kilometers from the central star and about 2 billion kilometers wide. Such a relative narrow, eccentric disc can only be produced by the gravitational influence of planets in the system, like Jupiter’s gravitational influence on our asteroid belt. In 2008 the NASA/ESA Hubble Space Telescope discovered the famous exoplanet Fomalhaut b orbiting within this belt, but the planet is not visible in this ALMA image.